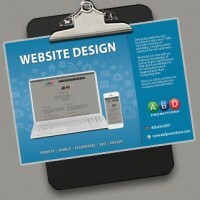 This brochure was created in house for our own Website Design department. We incorporated a screen grab from our own website, superimposed it onto a laptop and phone screen to show of our website and mobile design capabilities. The web icon background pattern and the vertical curve shadowing also help add dimension to the advertisement.